Welcome to the official website of author M. Ann Rohrer and the historical novel Mattie. Follow Mattie in her quest to find faith and love on the eve of the Mexican Revolution. After experiencing insurmountable trials, including escaping a killer and calling off her wedding, Mattie’s faith in God is shaken. In the throes of bitter disappointment, dark despair, and agonizing heartbreak, Mattie emerges a woman of faith. Recognizing God’s hand, she experiences peace, happiness, and enduring love. Becky Wright, Deseret News Review: 5/11/2013 “Mattie” is a captivating historical novel based on the true experiences of M. Ann Rohrer’s maternal grandmother who was born and raised in Colonia Juarez, one of the 13 Mormon settlements in Mexico. Included in the coming of age events of Mattie’s life is a brush with realities of the Mexican Revolution. “Mattie” has drama and realistic yearnings of the heart, seemingly unattainable dreams, disappointments, dangers and an intense trial of faith. Mattie endures after first wavering in her faith and finds strength beyond her own. Life-changing decisions seem to be around every corner for Mattie as she tries to listen to her heart and mind and search for God’s promptings. 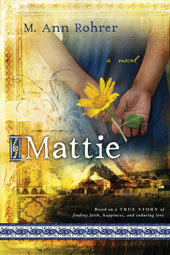 “Mattie” is a delicious read filled with history, intrigue, adventure, danger, finding faith and discovering God. It is the story of one young woman’s quest to find her true self. Rohrer has also documented the facts that she used to base each part of the novel. Shauna’s review: Mattie is an amazing woman! I can’t even imagine all that she endured. What strength she had! What determination! I so enjoyed learning more about the Mexican Revolution through the eyes of someone who was there. Cathy’s review: I enjoyed this book. There were a few places in the plot that were just a bit confusing, but for the most part I really liked the story line. I liked how at the beginning of each chapter we know what year it is for Mattie. I liked Mattie and how she did hard things in her life in order to be true to who she was and also to be true to God, she was truly a strong woman. The neatest thing about this story is that it is the true story of the author’s grandmother. I enjoy reading books that are about people that really lived and things that really happened. Lisa says : Mattie follows the life of Martha Ann Sevey. She is eleven as the book opens in the early 1900’s. She lives in a Mormon Colony in Mexico. Her story starts as her family is getting ready to bury her polygamous father. She has a large family with the usual family dynamic of squabbling siblings. Her life is simple. As a teen things change when she leaves Mexico to live with an older sister. She goes from girl to Young Woman and faces many challenges associated with growing up. Men, they are always a huge learning curve for any girl. Going from a quiet colony to a worldly town makes the transition a little more difficult. She faces challenges that will test her faith, her resolve, and her determination. She is a strong character. Official website of author M. Ann Rohrer, and the historical novel Mattie. Mattie is published by Cedar Fort, Inc.